We are a shareholder and partner of Relo8 Asia Pacific and members of ERC and EURA. We are also the official New Zealand representative for Air Inc and many large relocation management companies worldwide. 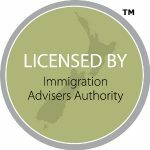 We are Licensed Immigration Advisers, licensed by the NZ Government to provide guidance and assistance to any person wishing to migrate to this country. Only consultants holding this license are authorised in NZ to undertake immigration assignments.